Hawaii Regional Cuisine (HRC) is twenty years old, and its star doesn’t shine quite as bright as it used to. Plans are underway to revitalize the state’s signature cuisine, but not everyone thinks it needs to return to centerstage. 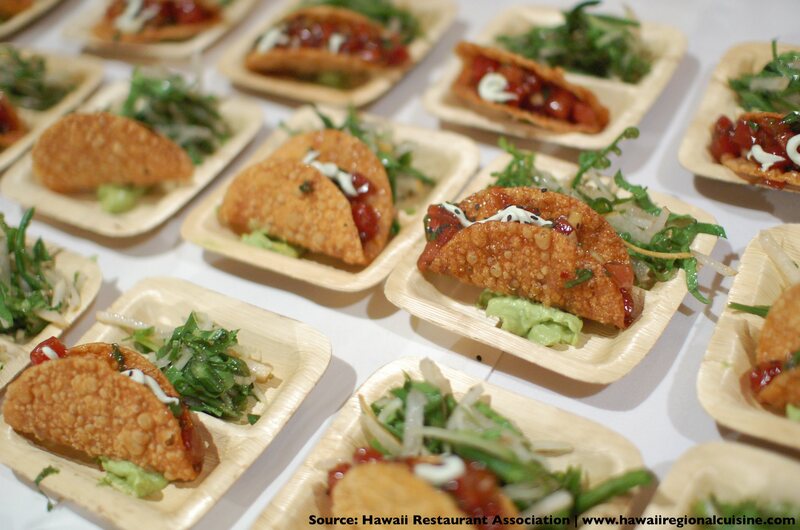 Hawaii Regional Cuisine was a food movement launched twenty years ago to give Hawaii a distinct, contemporary, trademark style of food and dining. Twelve chefs — including Roy Yamaguchi and Alan Wong — came together and developed flavors and dishes that became internationally renown. Combining “local food” with eastern and western influences and emphasizing local ingredients, it’s safe to say everyone in Hawaii is very familiar with the movement, even if they don’t know the name, or remember its history. With the 20th anniversary of the first chefs’ meeting coming up this fall, Erika Engle, writing for the Honolulu Star-Advertiser, brought us an update. She got several of the original chefs to reminisce about the ‘small fraternity‘ that got things started. And in the main feature, “Hawaii’s changing flavors,” she asked where things might go from here. The anniversary offers a chance to bring some of the shine back to the styles and flavors that once filled whole shelves of best-selling cookbooks. In March, there will be a “Chefs of Aloha” dinner at the James Beard House in New York. And in September, the original twelve HRC chefs will be inducted into the Hawaii Restaurant Association “Hall of Fame.” In addition an exhibit is planned at the Hawaii State Art Museum, and a special website has been launched to celebrate the anniversary. Lack of talent on island, combined with ridiculous rents and premiums have helped lead to the decline of HRC. Anyone who’s worth their culinary salt has left for better opportunity on the mainland. Also, a refusal of local people to be adventurous, try new concepts and ideas has led to the continued perpetuation that Roy and Alan are the greatest chefs since the invention of the loco moco. Hawaii also has a problem with repetition and lack of originality. HRC has fed us the same flavors for 20 years! Where does it end? So tired is the seared ahi with mango salsa and wasabi buerre blanc and the mac nut crusted insert-any-protein-here, that it should be a crime recognized by the Hawaii Restaurant Association to allow this mediocrity to continue. For those who continue mediocre Roy and Alan knock-offs, shame on you. Get an original idea… and learn how to cook! Ozawa should know. Now one of the talents behind the immensely popular Melt food truck, he worked at Nobu Waikiki, and previously worked for Nobu and Lutece in Las Vegas, under chef Nobu Matsuhisa. He’s always been one for forging ahead. And being a chef in a community that largely operates in the long shadow of Hawaii Regional Cuisine clearly has its challenges. The original twelve Hawaii Regional Cuisine founders are Sam Choy, Roger Dikon, Mark Ellman, Bev Gannon, Jean Marie Josselin, George “Mavro” Mavrothalassitis, Peter Merriman, Amy Ferguson Ota, Philippe Padovani, Gary Strehl, Alan Wong, and Roy Yamaguchi. There is a second famous group of chefs called the “Hawaiian Island Chefs,” which came together in 1999 to foster culinary education in the islands. They were Steven Ariel, Chai Chaowasaree, Hiroshi Fukui, Teresa Gannon, George Gomes, Wayne Hirabayashi, D.K. Kodama, Lance Kosaka, Jacqueline Lau, Douglas Lum, James McDonald, Mark Okumura, Russell Siu, Goren Streng, and Corey Waite. HawaiiRegionalCuisine.com, a website launched by the Hawaii Restaurant Association to celebrate 20 years of HRC. “Hawaii Regional Cuisine” as presented by the Hawaii Tourism Authority. The list of restaurants omits Padovani, who runs a restaurant and chocolate shop. This entry was posted in News and tagged HRC. Bookmark the permalink.